Keeping the focus on innovative design and technology to offer some of the best mobility solutions available, the manual wheelchair Sunrise Medical Quickie2 is made to make its users lives as accessible as they can be. As a lightweight folding chair, the Quickie2 is manufactured out of 7000 Series Aerospace Aluminum, meaning its cross brace is now more rigid, stronger and lighter, with a weight capacity of over 135kgs and an overall chair weight reduced to barely 1kg. These lightweight materials give the user a stable and strong ride, making it easy to fold and transport anywhere, all while providing comfort and freedom of movement. 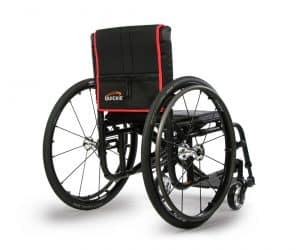 Due to a modular frame that adapts to your body, function, and environment, the manual wheelchair Sunrise Medical Quickie2 is extremely versatile. This product offers independent and interchangeable frame components that accomodate to changing conditions without needing to replace the whole wheelchair. An adjustable axle plate allows for a wide variety of seat-to-floor heights to choose from, along with an intuitive ease of adjustments. A time-tested frame developed by the Quickie engineering team reduces the overall chair weight, which allows it to hold up to 300lbs of standard weight capacity. With the Quickie 2 Sunrise Medical manual wheelchair, users can access every inch of their environment due to low seat heights and swing-in/swing-out hangers. This allows the user to maneuver around low surfaces and tight spaces. The Quickie2 folds up with little effort for easy storage and is able to fit behind the seat of any car, allowing you and your family to travel comfortably. Come visit our showroom or give us a call today. By speaking with one of our mobility experts about your lifestyle and specific needs, they’ll be able to guide you through the purchase of a mobility solution that perfectly fits you.